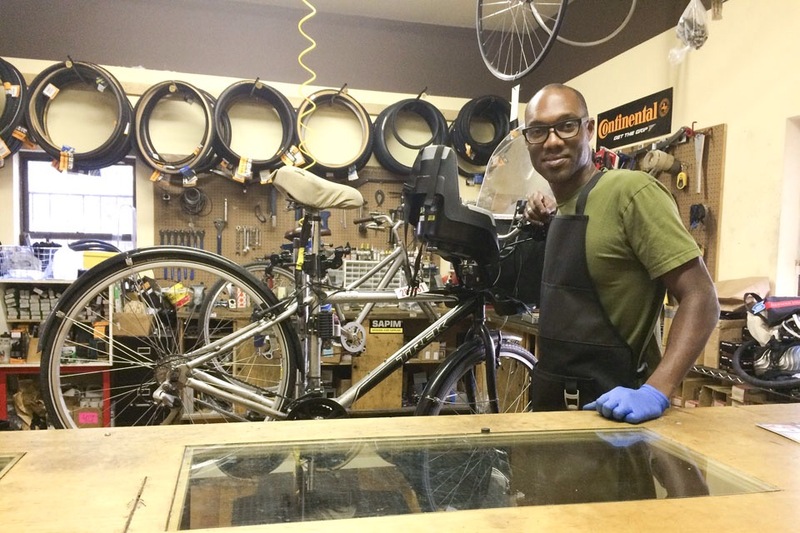 Harlem’s MODSquad Cycles will close at end of October | HarlemGal Inc. Patrons and neighbors said they will miss south Harlem bike store MODSquad Cycles when its owners close up shop and move to Luxembourg at the end of the month. street, was one of the street’s first upscale stores when it opened in 2008. Today, Frederick Douglass Boulevard is known as Harlem Restaurant Row after all the eateries that line the street. MODSquad, alongside a few other small stores, pioneered a wave of businesses opening in the neighborhood, including a bar hall, a sushi restaurant, and coffee shops, according to Carr. Beth Renaud, a MODSquad employee for the last six months, said that recent years have seen city biking become more common in the neighborhood. The store frequently serves patrons who are new to biking, many of whom come from the community around the store, Renaud said. As a result, the store has a local feel that represents the changing makeup of the community—longtime bikers and non-bikers alike. Columbia students and faculty have constituted a fair amount of the store’s customer base, according to Carr. Lily Rogers, GS ’15 and president of the Columbia University Cycling Team, said that she frequented the store. Tim Forrester, a frequent MODSquad customer and the co-owner of a butcher shop on Frederick Douglass Boulevard between 115th and 116th streets, said that he does deliveries and runs errands on his bike and was sad to hear of MODSquad’s closing. Forrester’s store, Harlem Shambles, moved to the strip three years ago. “I know MODSquad has been here a few years longer and they moved into the area before it turned,” he said. “They really helped to let other businesses know that you could do something successfully in this neighborhood,” he said. Moving forward, Carr, who has a Ph.D. in modern African politics, will be relocating with his partner, Danielle Tully, and their two children, Sekai and Mahdia, to Luxembourg, where Carr will pursue academia. Harlem's MODSquad Cycles will close at end of October. This entry was posted in Frederick Douglass Blvd., Harlem, Harlem bloggers, Harlem blogs, Harlem Restaurant Row, HarlemGal and tagged Harlem, ModSquad Cycles. Bookmark the permalink.